IN an extraordinary incident off Noordhoek in Port Elizabeth yesterday, an angler and the kayak he was fishing from were knocked clear out of the water by a marauding great white shark. Kayak fishermen are often visited by curious sharks while they are fishing, but this is believed to be one of only a few where one of these super-predators has actually attacked a kayak. Werner Coetzee, 35, and the front of the boat he was in, were knocked about 2.5m out of the water by the force of the attack, which occurred shortly after dawn, 2km off Noordhoek, on Port Elizabeth’s Wild Side. It was only Coetzee’s presence of mind, his emergency kayaking skills and the shark’s distaste for fibreglass that saved him from death. Coetzee moved to Port Elizabeth last month to take up a position with Coca-Cola. He is a seasoned kayak fisherman. He and three friends launched yesterday at 4.40am and paddled out, guided by their fish- finders and the GPS reading of where the best spot was for catching geelbek. They fanned out about 300m from each other and he was in the process of getting out his anchor from the hatch in front of him when the attack happened. “The shark came from underneath me, the same way it klaps a seal. I never saw him until it happened. I have a Pinnacle kayak which takes a big punch, but he knocked me and the front of the kayak about 2.5m minimum out of the water,” he said. “My kayak and all my tackle weigh 38kg and I weigh 102kg – so you can imagine. Coetzee said everything had happened so fast he at first did not know what had hit him. “I landed in the water and the kayak landed next to me, upside down. That was when I saw it was a shark. It was about 4m long. He was just a few feet away from me, biting into the front of the kayak. “We eyeballed each other and I saw him change his attention from the kayak to me. Then I started pulling myself onto the hull. By this time, Coetzee’s friends had realised what was going on and had paddled up to him. The ski- boat skipper had also motored up alongside. They loaded the damaged kayak onto the bigger boat and then moved in convoy back to the shore, with the other kayakers paddling alongside for safety. Coetzee said he believed he had also been saved by the shark’s initial bite into the kayak. He said he was quite sure it had been a great white shark. He lost two rods and his sunglasses in the attack, but this was nothing compared to being let off with his life and the rest of his R10000 rig, he said. 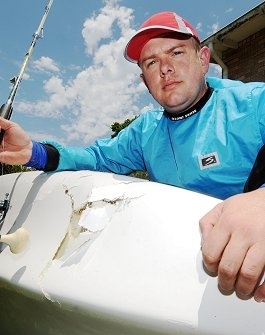 Besides the bite marks in the front of the kayak, the main damage was from the initial impact, which left a large indentation. While the attack was happening, he had had “no time to be scared”, but afterwards he had been shaken. “It was a random attack, perhaps linked to the presence of lots of geelbek, which run from November to April,” Coetzee said. Bayworld shark expert Dr Malcolm Smale said it was likely the shark had mistaken the kayak for food. His colleague, Dr Matt Dicken, said he was aware of a handful of similar incidents, but it was not common. Source: peherald.com . Photo Credit: EUGENE COETZEE.